It’s that time of year again! 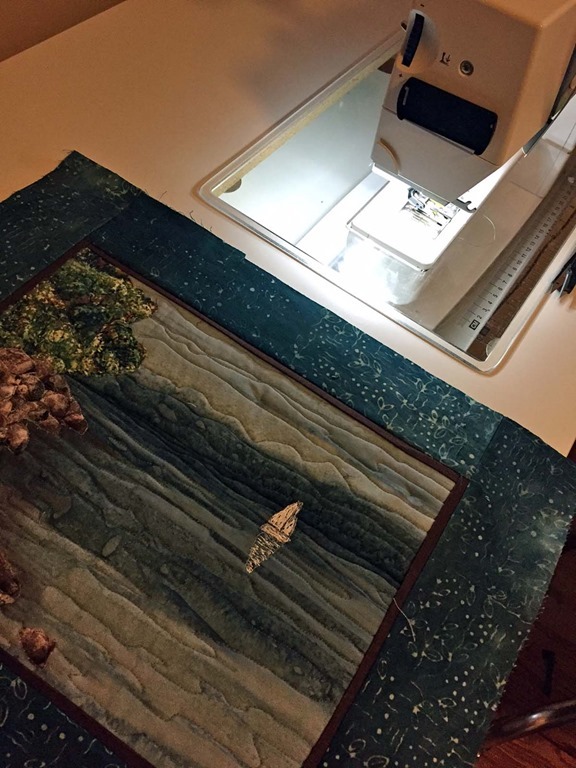 The holidays are over, and it’s time for Kim Lapacek of Persimon Dreams to begin the first week of the Project Quilting Season 10 challenge. When I saw the first challenge phrase, “Hope Springs Eternal“, I instantly thought of a photo my son & daughter-in-law sent us of our sweet little granddaughter looking up in awe as she “helped” decorate their Christmas tree. Isn’t she a sweetie? She’s just between 1-1/2 & 2…So this is the first time she’s really enjoying the tree. And that look on her face is just full of wonder and hope for what’s to come. Not only does it represent the hope of things to come for her, it represents our hope of flying half way around the world to see her soon. I’m so grateful that I live in an age where we can video-chat online weekly and get instant photos every day, but it’s just not the same as seeing them all in person. I can’t wait to give her a hug and play together. To start the challenge, I printed an outline of the photo on paper and used my Cutterpillar light box to lightly trace some of the important features onto white muslin with pencil. 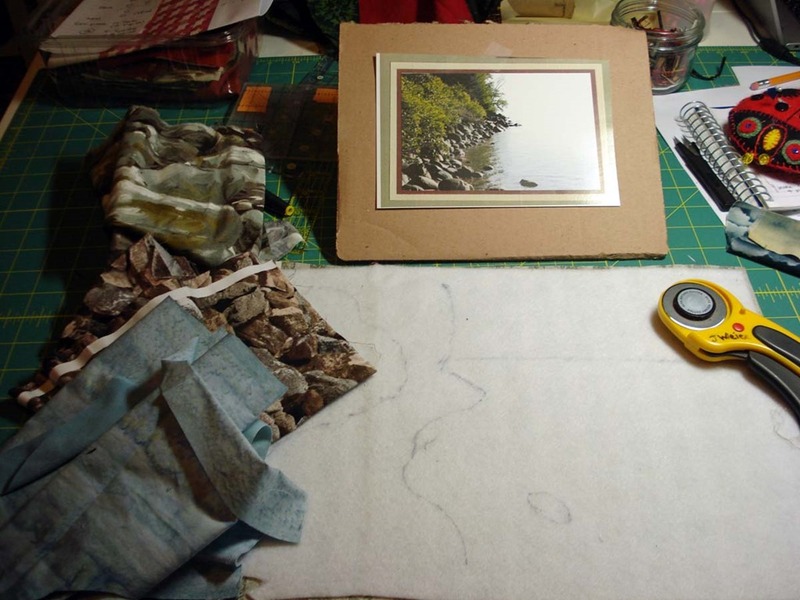 Next I sandwiched the white muslin on top of batting and backing and started thread sketching (which also served as free motion quilting) with black cotton Aurufil thread and my Bernina BSR foot. I decided to thread sketch everything…her sweatshirt, hair, and even the needles on the branches of the Christmas tree. And it helped to look at the photo of her beside me on my computer as I sketched in all of her features, starting with her eyes. my granddaughter has the cutest pink cheeks (just want to kiss them! ), and I couldn’t get the effect I wanted with thread…so broke out my stash of Derwent color pencils and started coloring… adding a bit if color to her lips, her hair, and some shading. Now that’s a bit better! 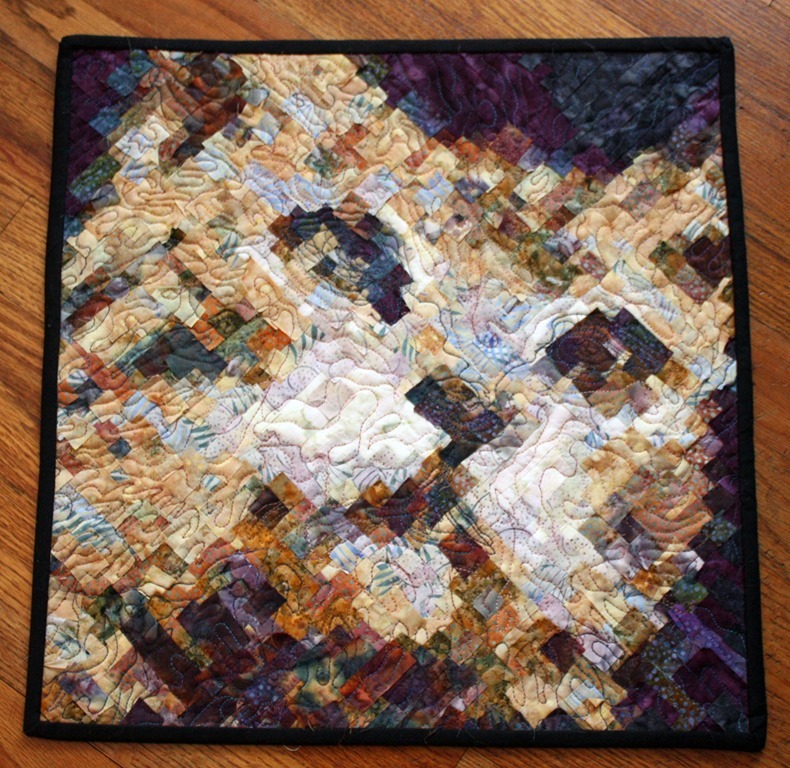 A little more shading, and then I added a double border of batik fabrics. I started so late on this challenge, … I wasn’t sure I’d have enough time. But once I started, it just came together and I loved every minute. You really CAN do it in a week. 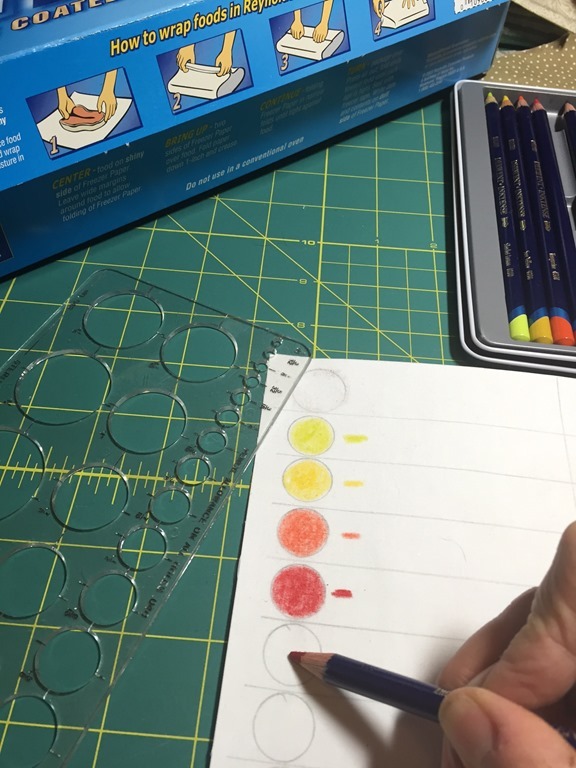 Participating in PQ is so much fun, because it forces me to try a new technique or idea and actually get it done. I don’t have time to worry about failing or to quit and start over. It is what it is. And I can’t procrastinate when it HAS to be done from start to finish in only one week! The voting starts this Sunday afternoon (January 13, 2019). Come vote for your favorites…but of course I’d love your vote! VOTE HERE. Be sure to scroll down to the end. I believe the voting is open January 13-19 and the winners announced Jan. 20. 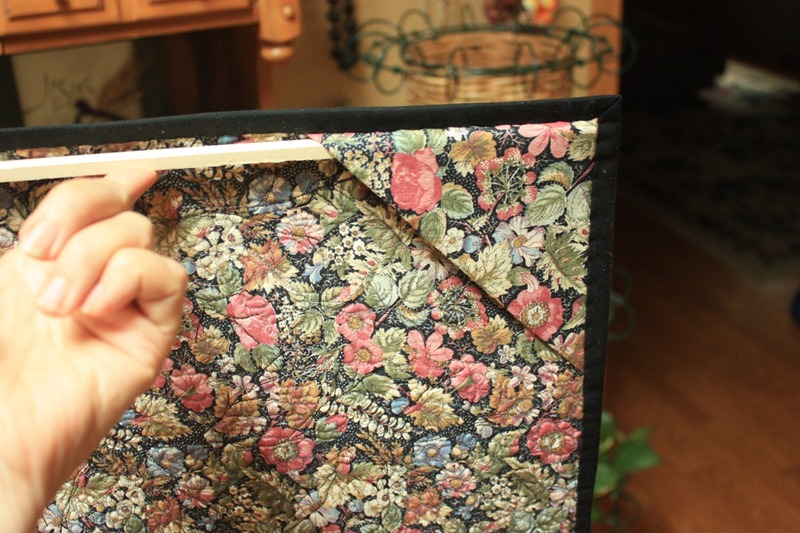 So…I thought about the challenge for Project Quilting this week…A STITCH IN TIME SAVES NINE. And nothing came to me for several days. I thought this would be the week I just didn’t enter. 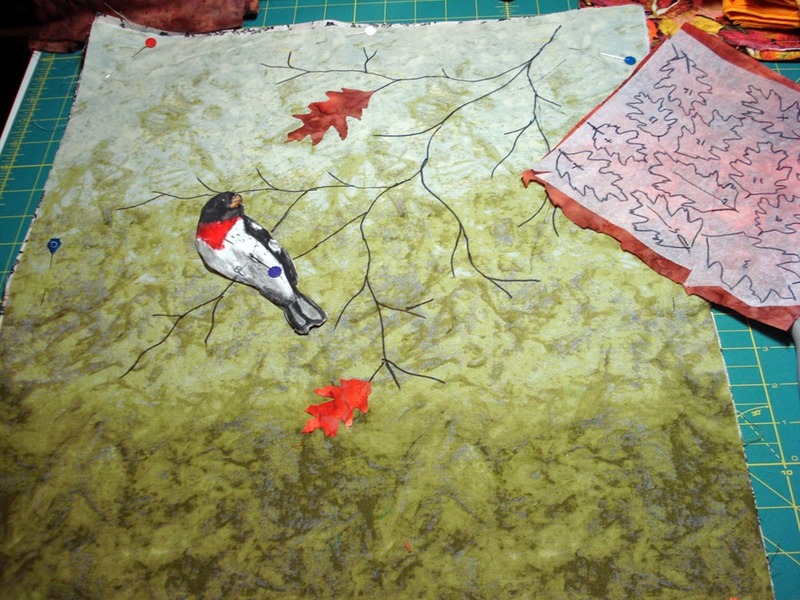 I started to equate “a stitch in time” with the little birds getting their nests “stitched” together with bits of string and twigs. And then I started to visualize nests made out of fabric selvages and bright fabric strips. And the idea started taking shape! 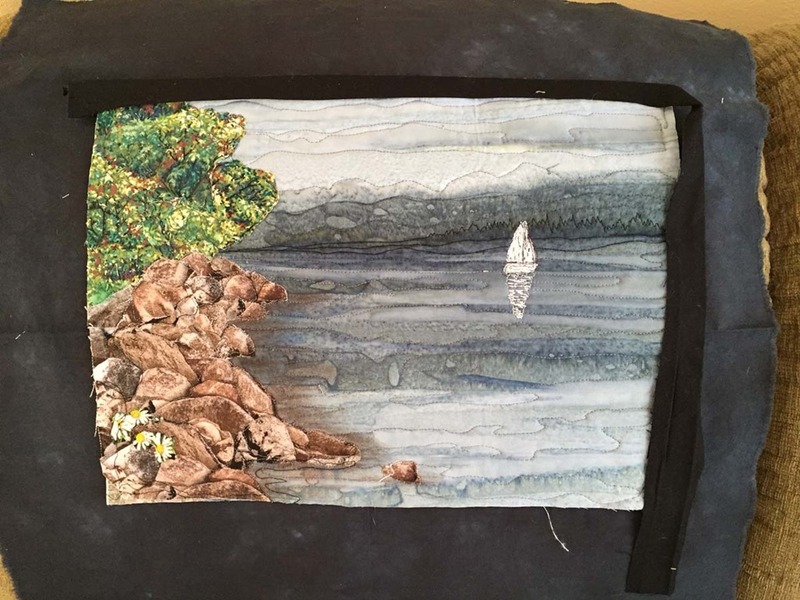 I used scraps from my stash to flip and sew the background, and fused the appliqué shapes on top. Then cut up a bunch of my selvedge edges I’ve been saving and quilted them down to create the nest. I even found the Stonehedge fabric selvage from their fabric called “a stitch in time”!! What are the chances? Totally unplanned! How cool was that? 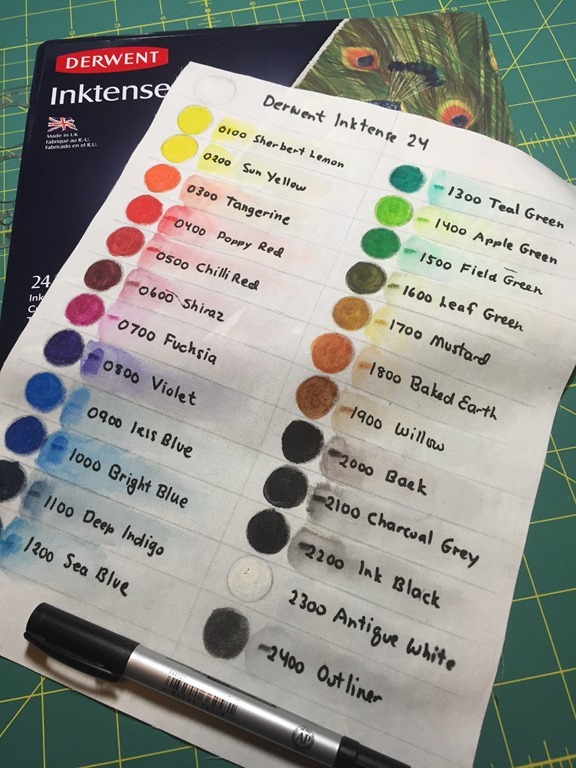 I treated myself to a box of Derwent Intense 24 Ink Pencils earlier this year, and an online class from IQuilt entitled “Artistic Painted Applique”. 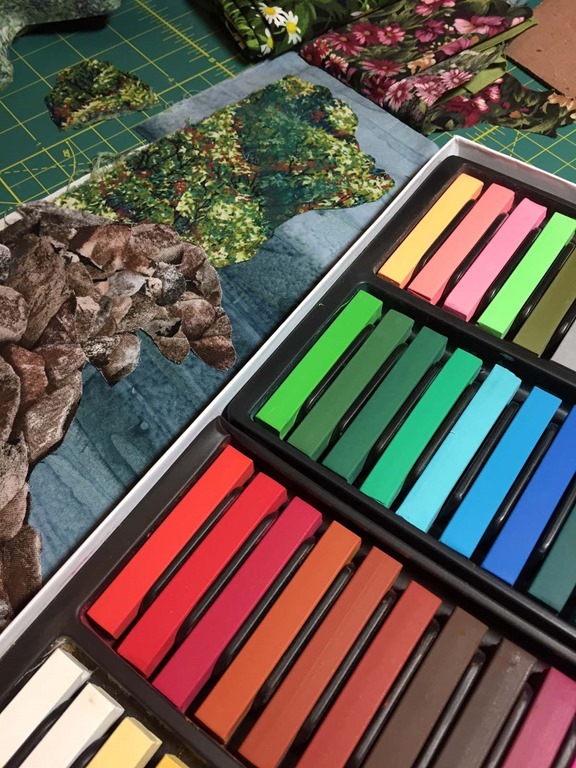 The instructor, Linda Poole, showed us how to first create a pallet of color to familiarize ourselves with the variety of ink pencils in the pack. 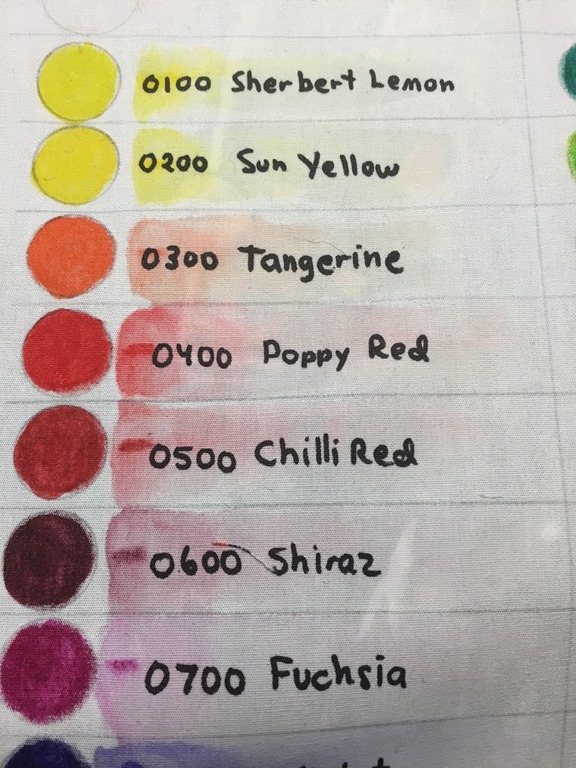 After Ironing some freezer paper onto the back of a piece of white cotton, I drew some circles and filled each in with a different color of the Inktense Ink Pencils. 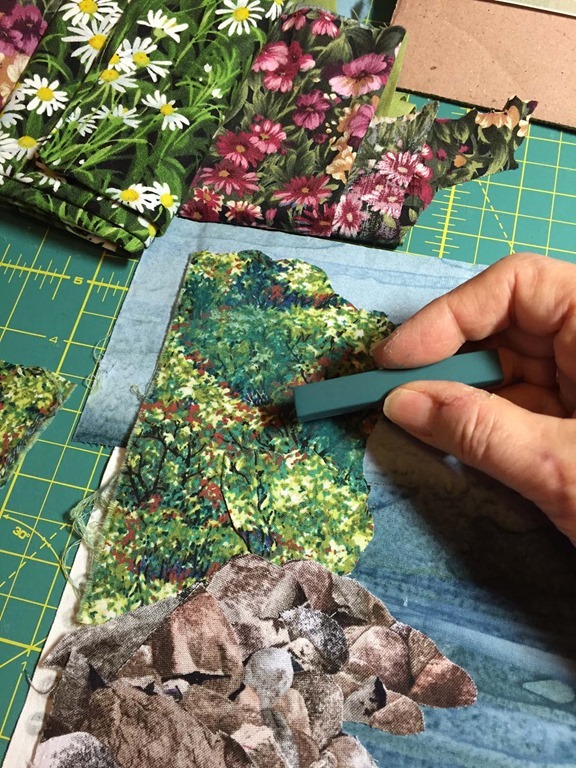 They react like watercolor or paint on the fabric. 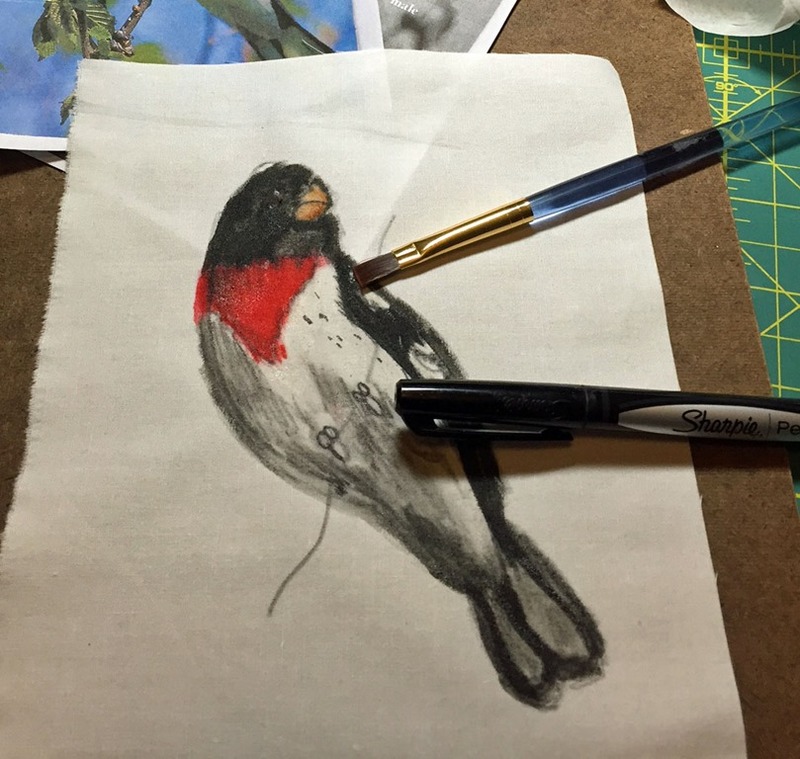 Next I backed a piece of stabilizer to the back of my fabric & sketched a bird I’d seen at our feeder earlier this year. 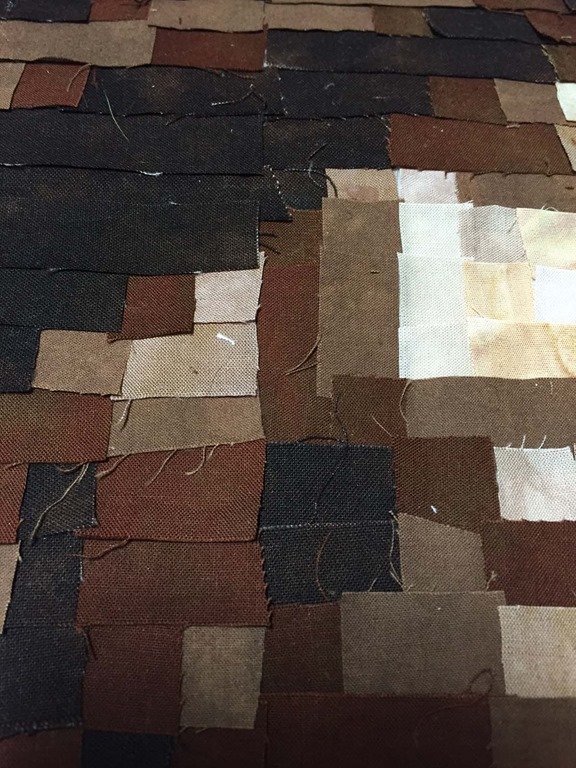 Then it was just a matter of coloring and adding the textile medium to blend it all together. The color is beyond the sketch lines because I needed to that cut it out and fold over the edges to applique. I usually start with an overall idea of what I want to do…many times from a photograph I’ve taken. 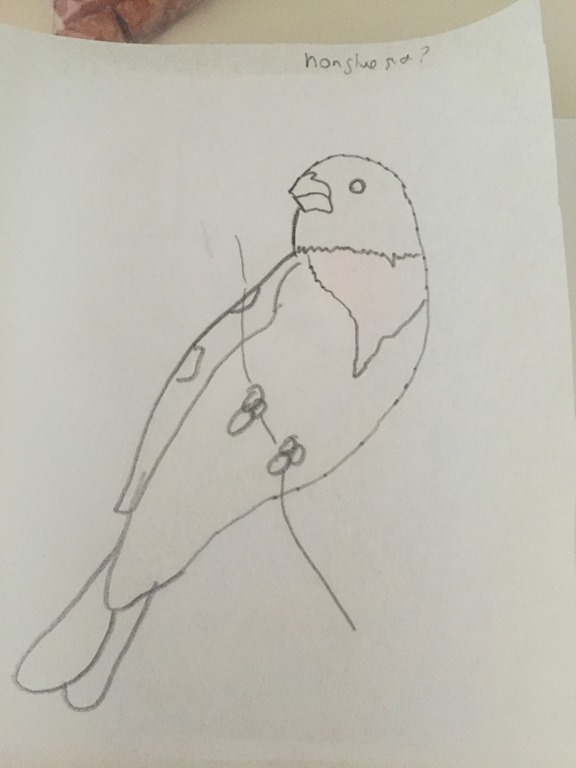 But this time I worked “backwards”—having to come up with a background scene to place my little bird on. It took me awhile to figure out what that would be. 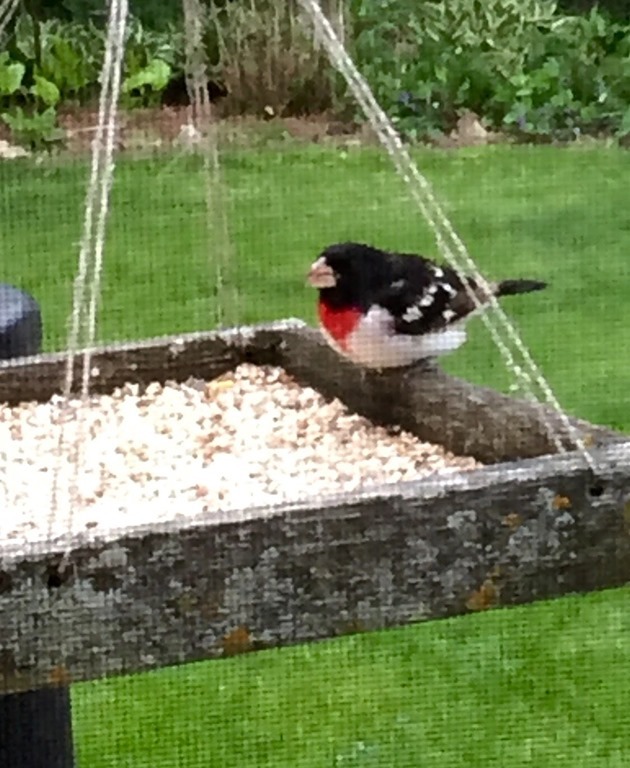 The bird seemed to want to perch itself on a branch of some sort. 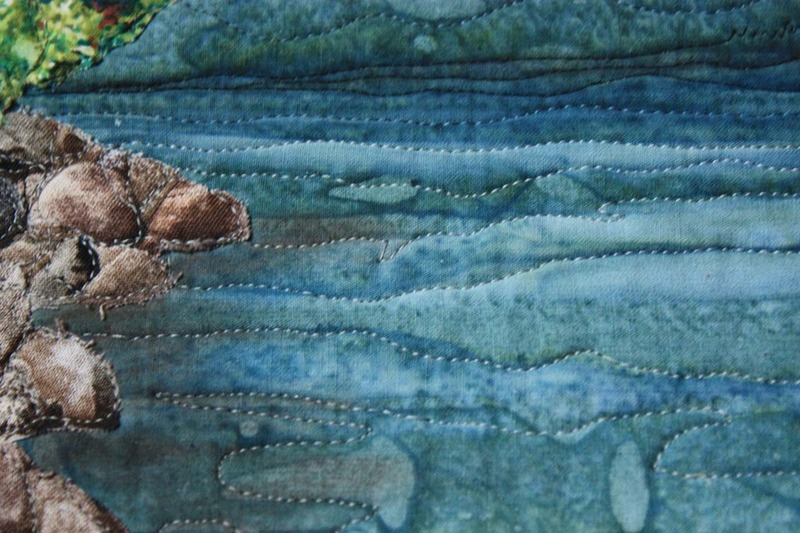 I was lucky enough to find a beautiful batik in my stash that worked perfectly for a background. 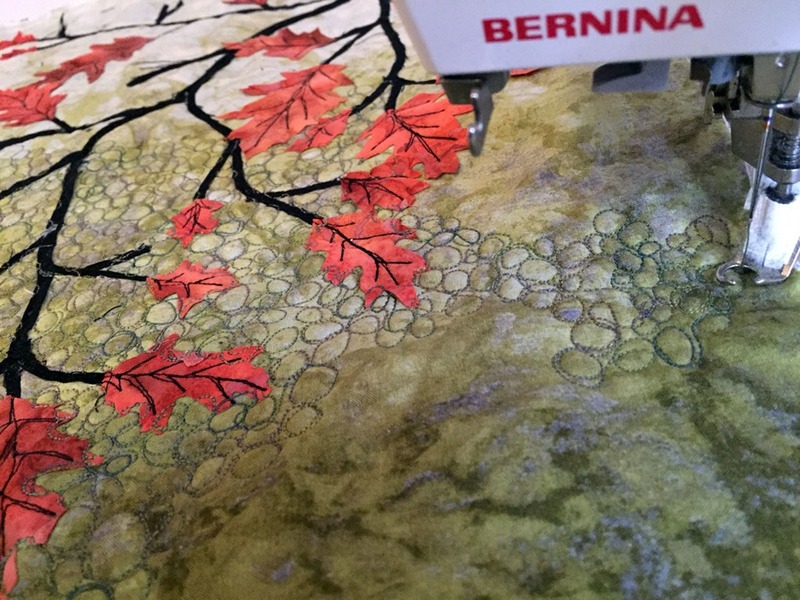 I drew in some lines where fabric “branches” would be fused, and cut various sizes of leaves out of a multicolor orange batik for the leaves. 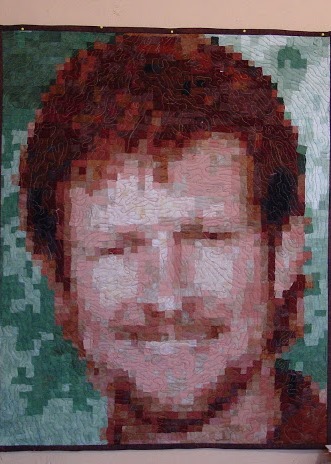 Next came the free-hand overall quilting to accentuate the veins of the leaves and down each branch. 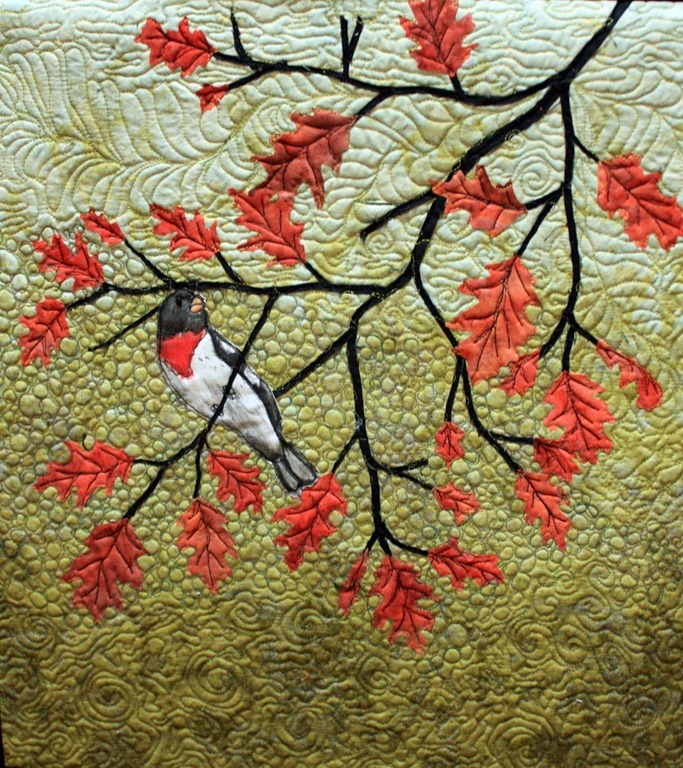 I decided on overall “pebble” quilting for the background around the bird and some branches/leaves. 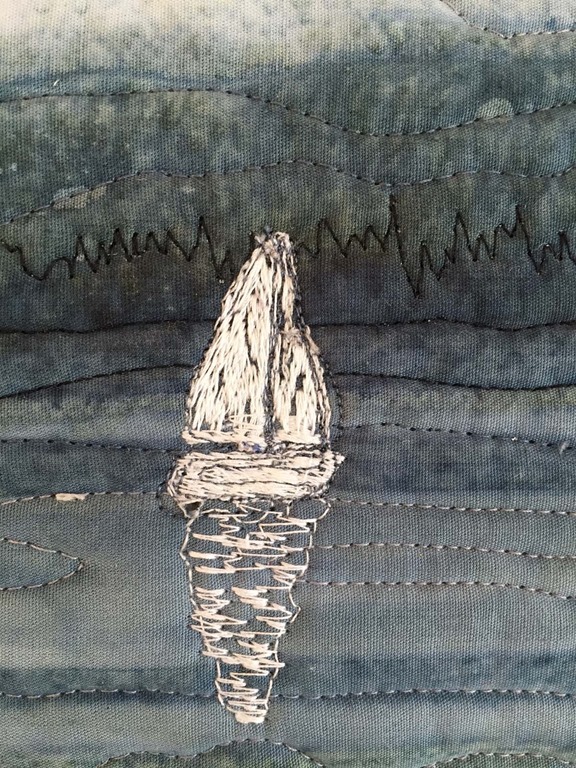 and a feather stitch on the top portion, and swirls/meandering on the bottom. After trimming, I added folded triangles to each corner to make it easy to mount on the wall with a simple thin wooden dowel and one nail or hook. And I “framed” it with a black binding. 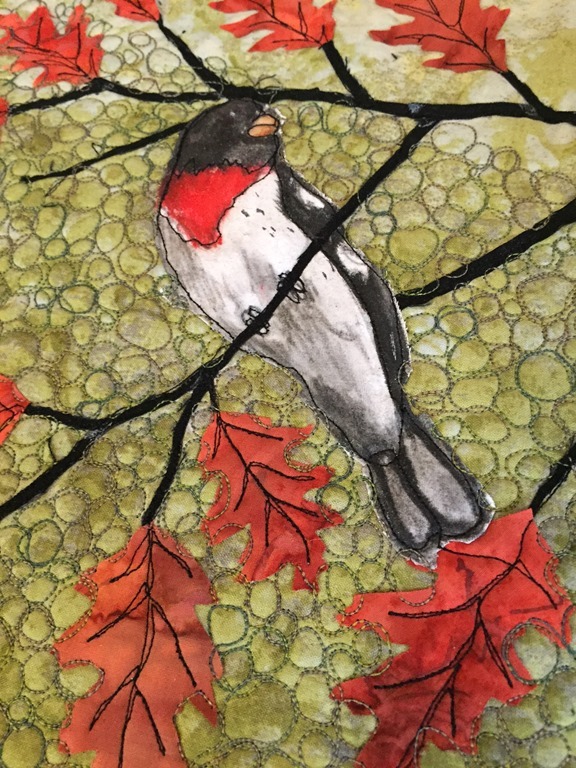 The Red Breasted Grosbeak I saw earlier in the spring hasn’t come back, but this quilted art wall hanging will be a permanent reminder of his beauty! Hope you enjoyed watching the process! 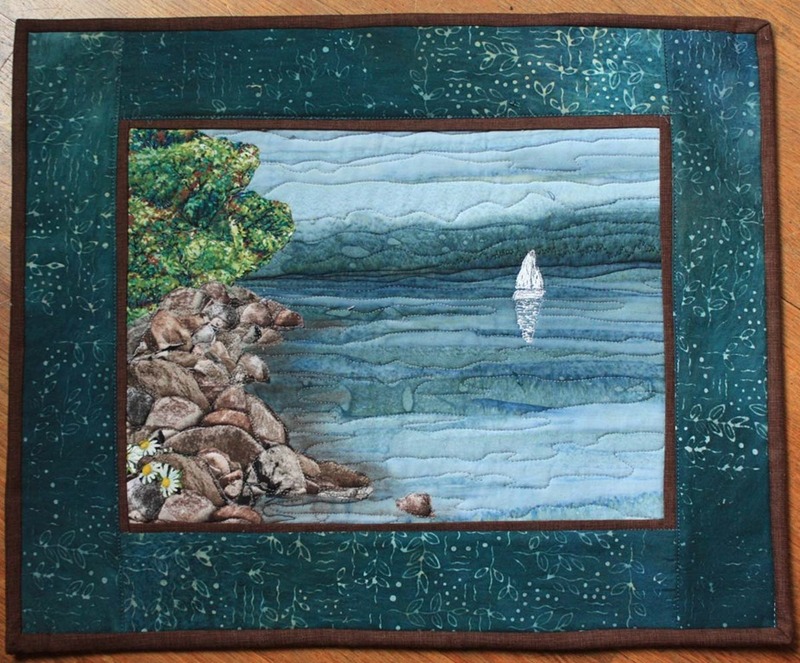 This week’s Project Quilting Challenge is “I NEED A VACATION”. 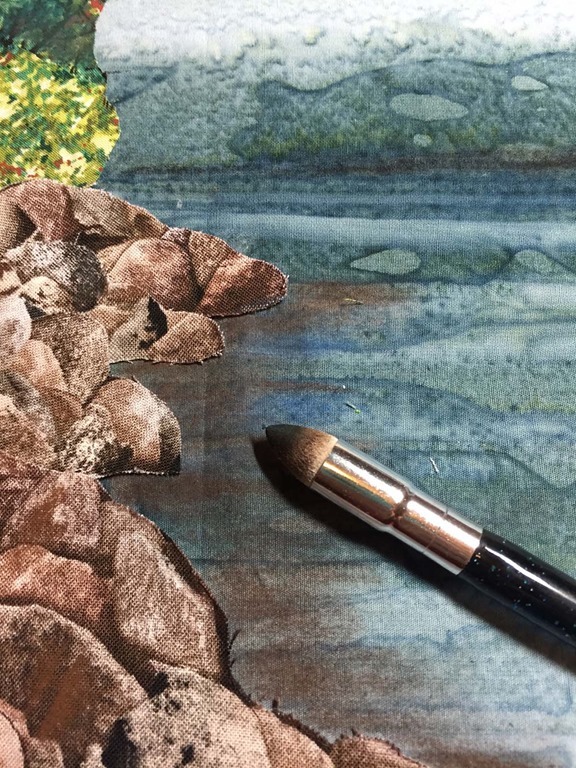 My favorite vacations are traveling to a beautiful spot, finding a cabin or home to rent, and relax by the lake, river, or ocean and just take in the beautiful view. We might do some day trips in the area, like hiking or going out for lunch, but always coming back to the serenity and beauty of the surroundings of the spot we’ve rented. I found a photograph I had taken this past summer when we ventured up to one of our favorite spots near Bayfield, Wisconsin. A short walk from the back of our cottage is a rocky private beach with a spectacular view of Lake Superior, with Bass Island and the rest of the Apostle Islands, in the background…it was breathtaking! I loved walking down to that spot with a cup of coffee every morning to take it all in. So when I heard “I need a vacation” as the theme, this is where I’d want to be. 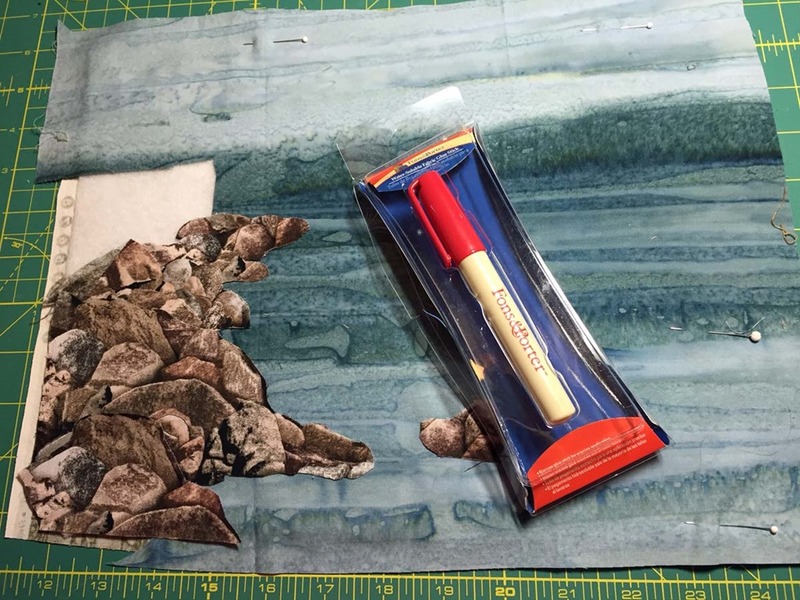 My first step in creating the scene was to find fabrics that had the same feel as the photograph (and my memory of it), and cut a piece of batting and backing to the size I wanted to serve as the backdrop “canvas”. 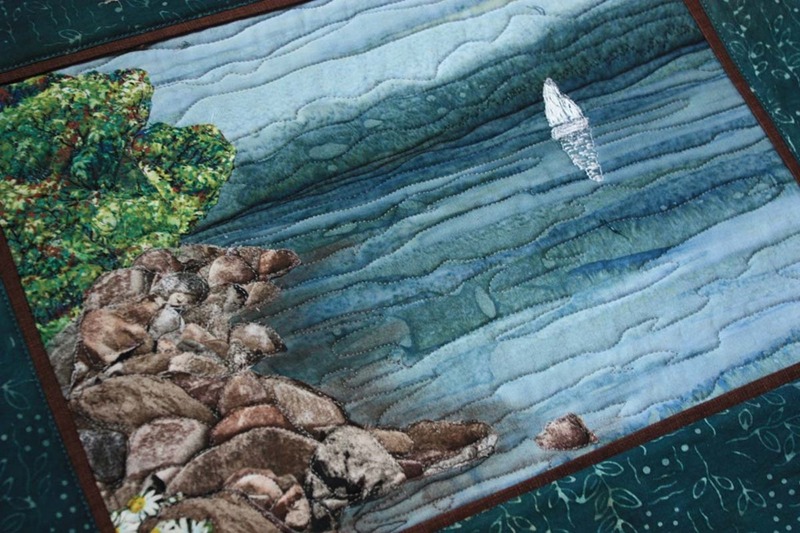 Then I cut and positioned the background and shoreline onto the batting. 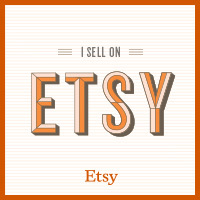 I had just purchased something new—a Fons&Porter glue pen. It worked great to keep everything in place. I found it a lot less messy than the regular glue stick. 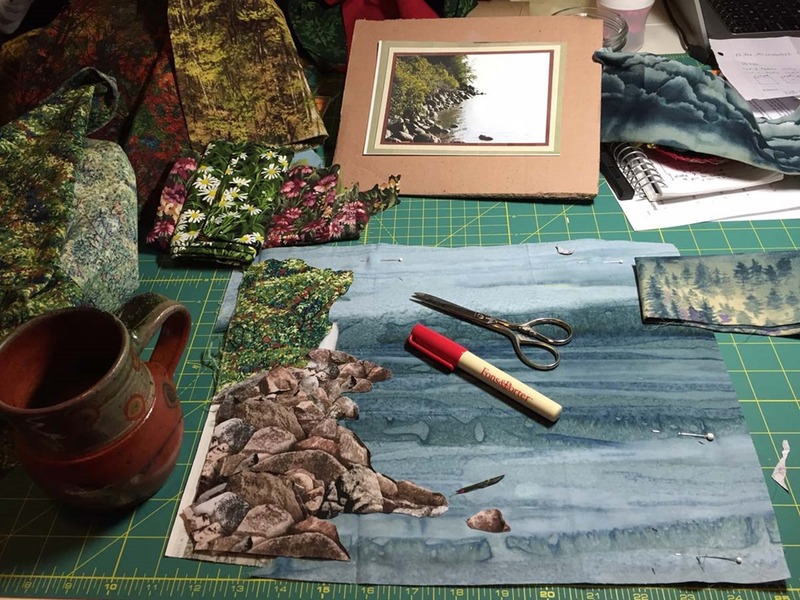 Bit by bit, auditioning fabrics–some that didn’t work, and others that did, I continued adding to the scene. I’m glad I purchased the set (on sale). I used a blending stick to blend it in. I didn’t care for the dark blue-grey, it seemed too dark and gloomy. 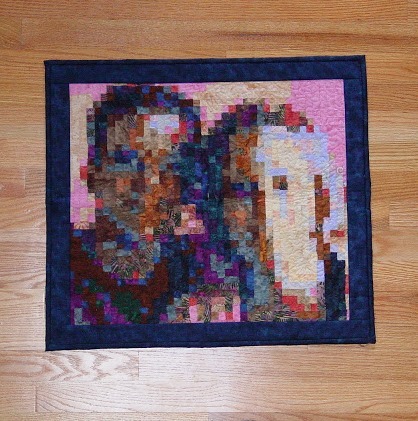 Here the borders have been added…along with more batting and backing. 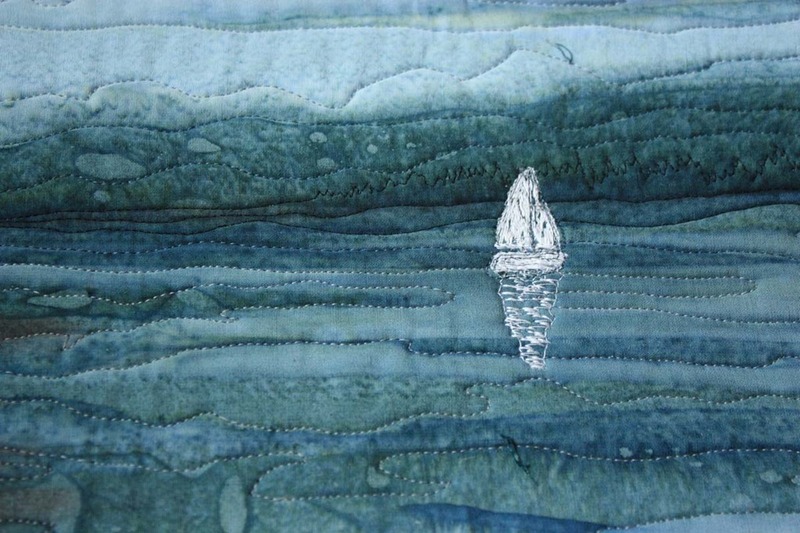 and the thread painted sailboat in the distance. 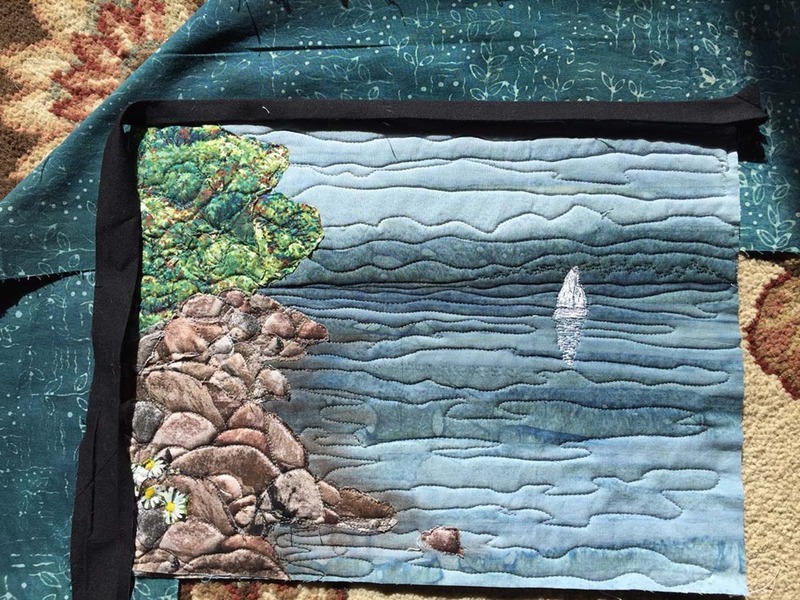 I hope you’ve enjoyed the journey, and that you’ll stop by Persimon Dreams website PROJECT QUILTING and vote for your favorite quilts! The voting begins February 21 and runs through February 26 (2016). UPDATE: The voting has closed. I came in #3 of 39 entries–no prize, but no bad! I found this photo of my dad (Harry Haverkate) that I just love. Isn’t he handsome? 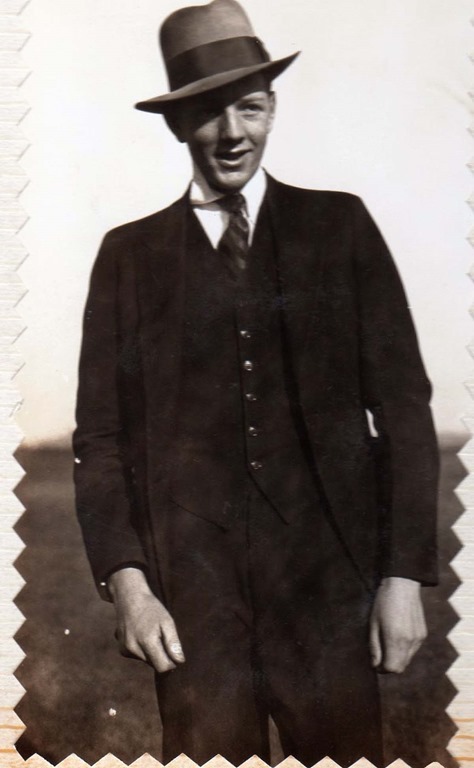 I’m not sure of the year, but It was probably taken around the time he was dating my mom (early 1930’s), when he was in his early 20’s. Back in the time when men often wore suits and always wore a hat. 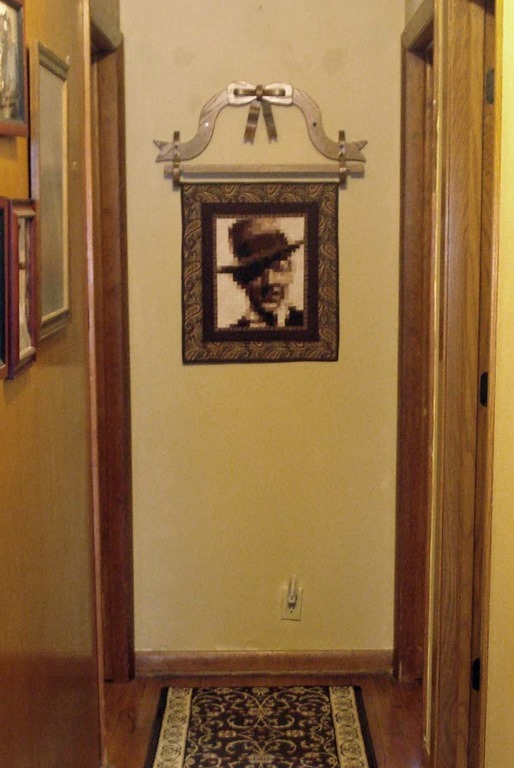 I thought dad looked so “dapper” with his hat tilted just right. 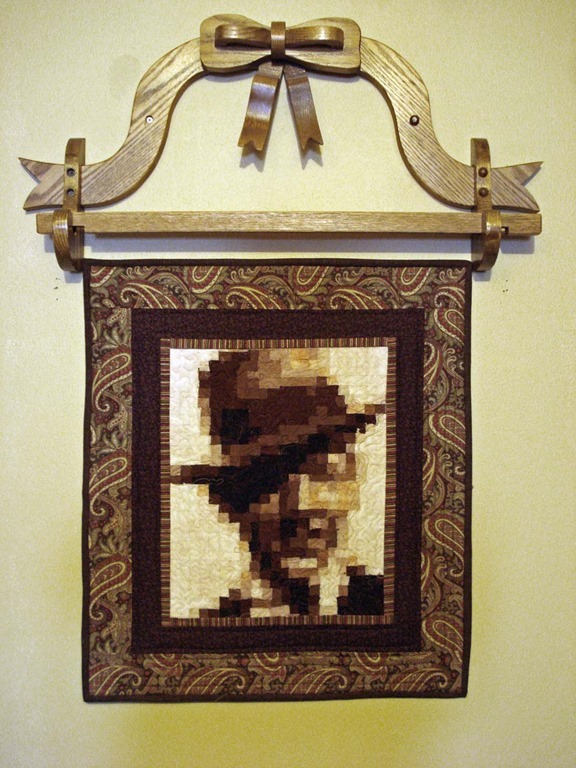 So I named this quilted wall hanging “Dapper Dad” to hang in our hall in his honor. 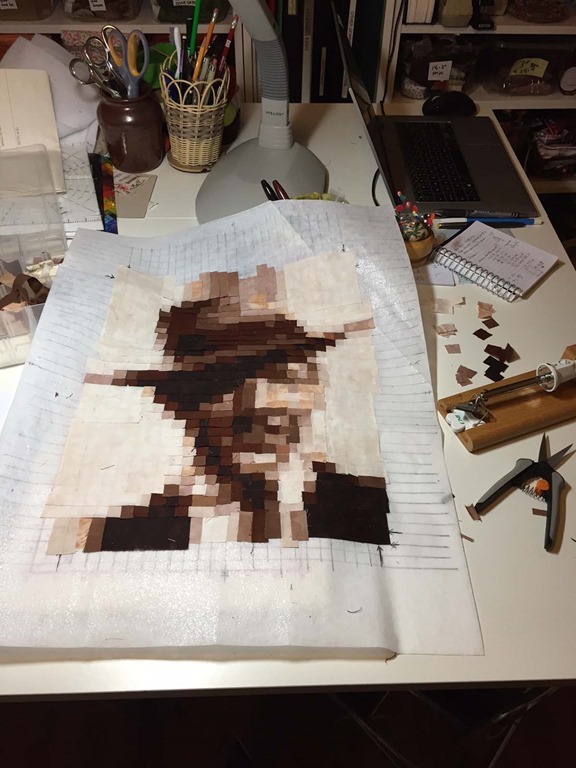 I scanned the photo, cropped it, and then used the website to convert it into a document with numbered pixels (squares) that I could print out to use as a guide. Next I drew a 1/4” grid (with my ruler and permanent marker) on a piece of light weight fusible interfacing, and placed it fusible side up on my portable ironing surface. 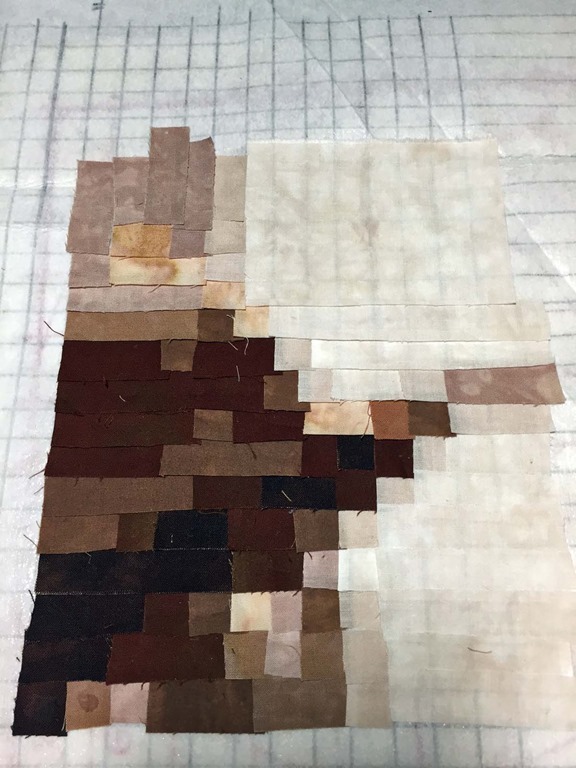 I cut strips of my hand dyed brown fabrics just a bit wider than 1/4”, and I sorted/numbered them light to dark. 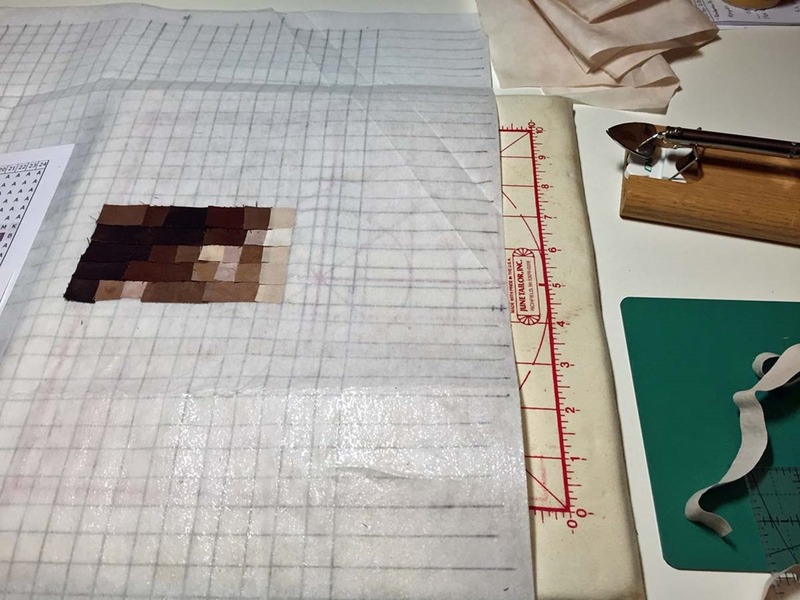 Using the numbered grid as my guide, I started choosing and cutting individual 1/4” squares and “tacking” them onto the fusible interfacing with my small iron. In areas where more than one square was the same color, I used strips instead. 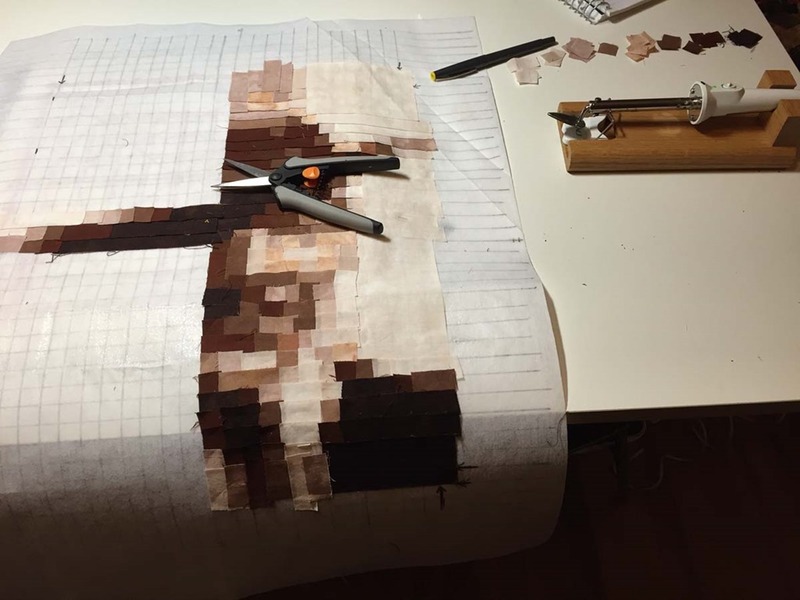 And in large areas with the same number I simply cut squares or rectangles slightly larger than the section. It’s very much like putting a puzzle together, but you’ve got a guide to help you. It’s very “mindless” and relaxing. I love doing it. Here (above) are the strips in a bin helping me keep the numbers straight. You can’t see much of anything as you’re putting the puzzle together (see close-up shot above); you just have to trust that it’s going to work. But when you back up a few feet, you begin to see the photograph come to life! Then back up even further, and it really begins to look like something! 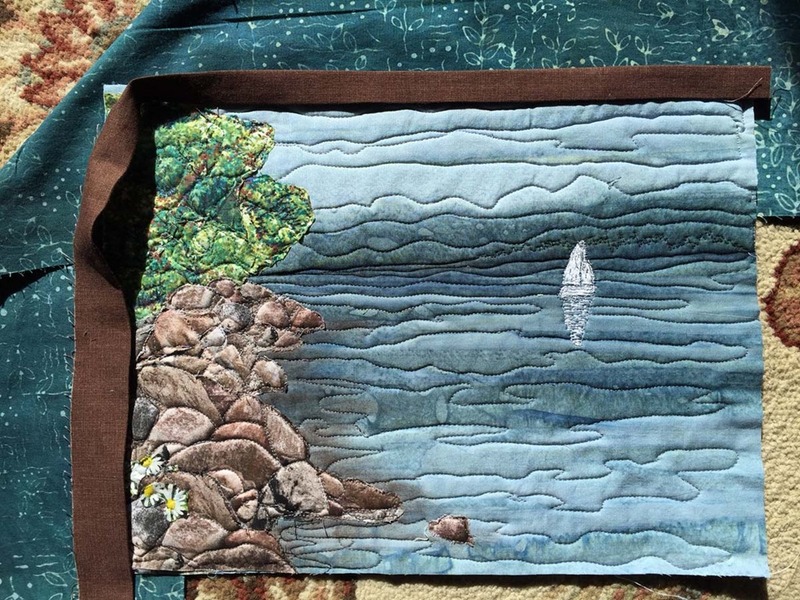 After adding the batting (pellon fleece) and a backing fabric, I took the fusible interfacing with the squares completely cover it, to my Bernina and free-hand quilted using similar colors of variegated cotton thread. From a distance, you can really see “Dapper Dad”. 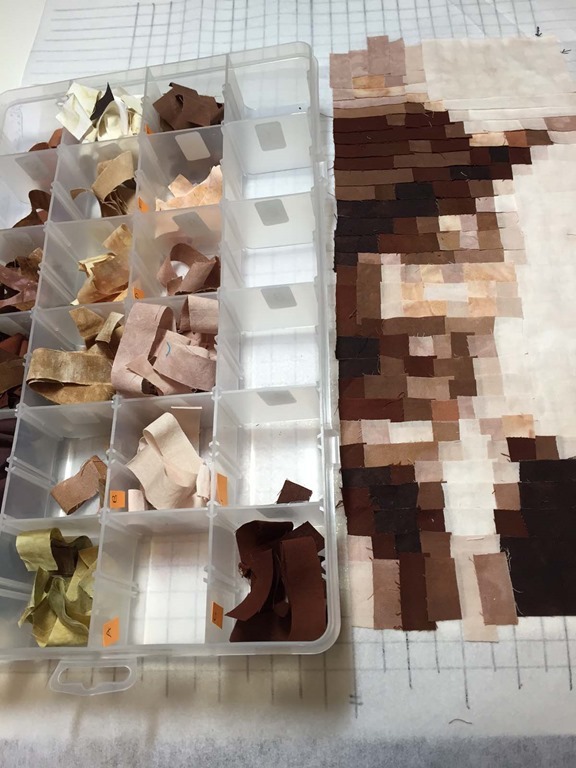 Have you tried pixelating in your quilting? If not, give it a try—it’s so rewarding. Hope you enjoyed reading about the process. 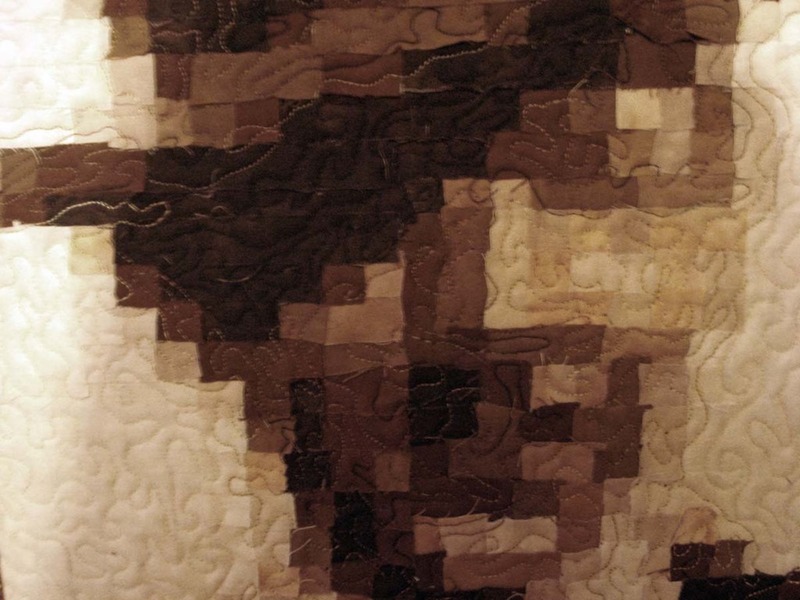 Have you tried pixelated quilts? I’d love to hear how your experience was. Please post your comments below, and include a link to your photo if you can. 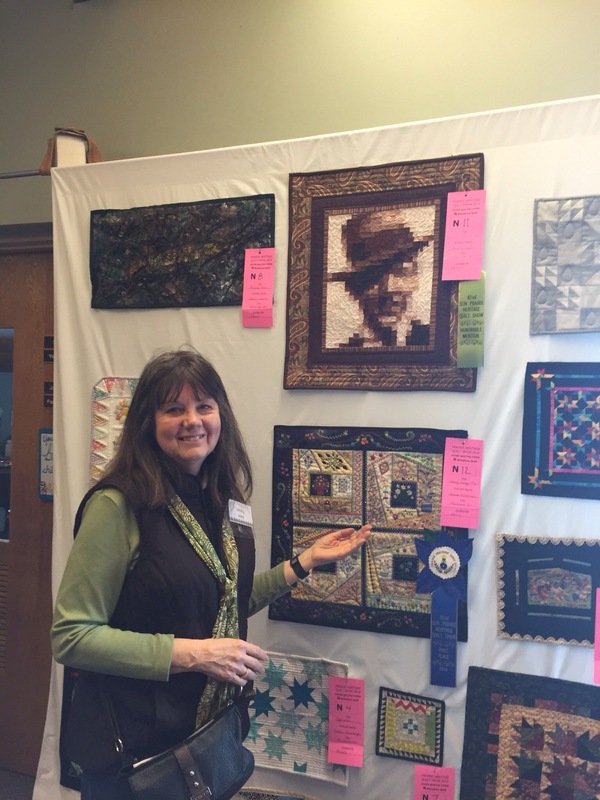 UPDATE: I was so pleased to find out the photo quilt got an “honorable mention” ribbon at the Sun Prairie Quilt Show earlier this week!